Considering Burma: ‘Schoolboys playing politics’ | What moves you? Defeating colonialism became a primary objective by the 1930’s, with a rise in Burmese political activity and nationalism. Anti-colonialist leaders rose and sought opportunities for change in militant ideologies. Bogyoke Aung San remained greatest among them. Aung San and a group of university students of his time known as the ‘Do Bama’ society, which one scholar calls “schoolboys playing politics,” were ultimately the ones who led protests, formed the Burmese Independence Army during WWII, and later formed the first independent government. 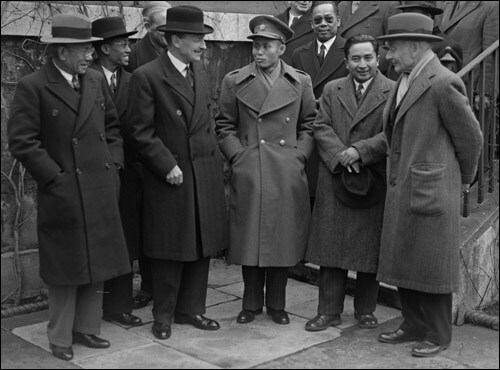 Initially, Aung San sought opportunity and training from the rising power of Japan at the beginning of WWII, who promised Burmese independence. Quickly, Burma became the prime battleground between Japanese forces and the small Burmese Independence army against primarily British forces (largely consisting of Indian colonials), the US and allied minority groups in western Burma. For England, Burma stood as a buffer between Japanese expansion and it’s most important colony, India. Japan saw the conquest of Burma as a strategic manoeuvre. Pushing out the British meant stopping the US and British supply route along the Burma road to Chiang Kai Shek’s army in China. Initially, Japanese forces pushed the allies back, taking the capital, Mandalay. The cost for the Burmese would be extreme. By the end of the war no buildings were left standing in Mandalay, though the Japanese officially granted Burma ‘independence’ in the summer of 1943. “In many ways this was a completely sham independence” (Thant Myint-U 2006 p. 232), as Japan continued to rule by its well known interrogation centers, summary executions and subjugation of citizens. Then, in early 1944, the British began what can be considered a reconquest of Burma following a major battle in the principality of Manipur, where the British brought forward half a million soldiers, with tens of thousands of additional laborers, fifty thousand vehicles and hundreds of elephants against two-hundred thousand Japanese. By the end of the battle, nearly half of the Japanese contingent would lose their lives. (Thant Myint-U 2006 p. 236). With Japan in retreat, independence-minded Aung San began scheming. Despite his initial loyalty to the Japanese, he led a revolt against them. Through these actions and diplomatic finesse, Aung San was able to win the favor of the right decision makers amongst the English contingent. At one point, Aung San was curiously asked by a British commander, “Go on Aung San, you only came to us because you see we are winning!” To this Aung San replied, “It wouldn’t be much good coming to you if you weren’t, would it?” At the end of the war, England planned to reinstate a colonial government — though with a Burmese governing council and a ‘special place’ for Aung San and his league. However, with outright independence the goal, this was not acceptable to Aung San. Arguments and threats went back and forth. Eventually, Dorman Smith (England’s man in Burma) stated to the government in London that only a provisional government under Aung San would ease tensions in the country. Finally, on January 4, 1948 Burma would receive full independence from the British. This was too late for Aung San; in July, 1947, he and much of his provisional government was gunned down during a morning meeting. Post-independence Burma was extremely fragmented and still devastated from WWII. Seeking to bring all of Burma under one flag would met heavy resistance from many non-ethnic Burmese groups throughout the country. The leadership of U Nu, by most accounts, appears to have been a genuine attempt to move Burma out of the moribund and towards a federalist system. However, in the end, forces proved too much. By 1962, Burma was under the military rule of General Ne Win, who would establish a one party state, expel all ethnic Chinese and Indians, nationalize the economy and close Burma off from the rest of the world. With history past, a number of questions are raised. Curiously, is Aung San a recognized hero by the people and the government, and how does the government perceive its own history? What is the ‘mood’ among the people…will I ever know beyond the smiles I expect to be greeted with? Will Burma feel like a ‘closed’ society to me, as a foreigner? Will I see or encounter any other recognizable minorities other than ethnic Burman in the cities of Yangon and Mandalay? Coming from bustling Bangkok, will the results of a poorly planned economy be obvious on the city streets and beyond? These questions and more. I really don’t know what to expect. nice to hear things are going well,all the best. Very good summary of an extremly twisted part of the history of a very complex country. Should you have time, do visit the National Museum of the Armed Forces (or similar) in Yangon. It is basically a visiting card. It demonstrates the “Weltanschauung” of this extremely reclusive regime. It shows that in their minds, they are actually running, no, saving the country that, in fact, they have brought to the brink of destruction. The fact that their arch enemy, Aung San Suu Kyi, is actually the father of their own system, the contemporary Burmese Army, the Tatmadaw, is yet another typical twist of Burmese history. I remember the fuss each year whether Aung San Suu Kyi would be invivited to the National Day ceremony, which, in a way, was a celebration of the founding father, Aung San, who, as said before, is also the founder of the Tatmadaw. The smiles you will encounter you will not forget. Still, yes, it is challenging to look beyond the smiles of the people. Christina Fink is not too wrong when she describes the Burmese peole as a people trapped in “living silence”. Yes, partly, she is right. My own personal experience though with many Burmese, behind closed doors, demonstrated to me that Burmese can speak their mind about the terrible situation in which their country has been driven by a bunch of incompetent bureaucrats in uniform. I hope you will also make these experiences. on February 15, 2010 at 4:40 pm | Reply Considering Burma: Equality « What moves you? Unfortunately Marcus, I didn’t make it to the National Museum. I had a choice on the last day and decided to meet up with a couple who work for a US engineering firm in Yangon, designing and distributing water pumps to rural areas. Interesting work. The four of us will be posting reflections about our time in Burma in the coming week, some of which will directly address certain undertones of discontent, frustrations and hope we encountered. As you say, there is a certain level of awkward ‘silence’, though in some contexts people were consistently eager to share certain thoughts with us. I was surprised many times. Good and Bad surprises. Burma didn’t fit the ‘perfect’ picture of a military run government, a highly censored society or conflict ridden country. In some ways though it certainly did! I found it important to distinguish between what I could know and what was not possible for me to see or know as a visitor (more on this later).